Tills are used to reconcile cash at individual POS stations/cash drawers—they keep a record of every cash transaction performed at that terminal. Tills are also used to log pay-ins, pay-outs, and bank drops. If you have a coin dispenser, your till adjusts accordingly. On the point of sale, navigate to the dashboard. Under operations, select Tills. Then tap, New Till-Drawer 1. From the dashboard, tap Tills and select your current open till. Next, select the Pay-in or Pay-out button. Tap Done and a receipt will print for you. Navigate to Settings > Tills. Type in the value you would like to deposit in the safe. To re-open the till, navigate to your dashboard screen, then select Tills. Select Held Till- Drawer 1. Once you place a till on hold, you may only proceed with closing the till. Please note that you will not be able to re-open that same till to make transactions with. At the end of the shift, navigate back to the dashboard and tap Tills . 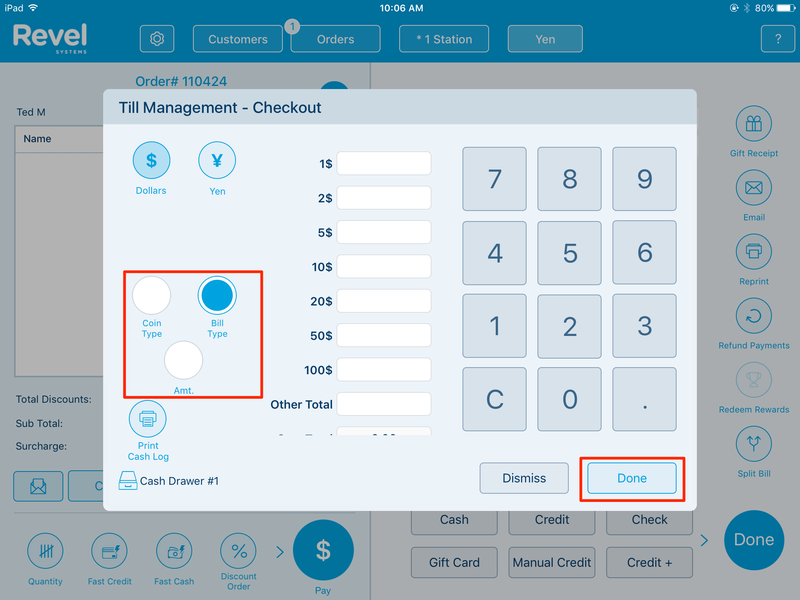 Select the current till and tap Checkout (If you held a till earlier, you will see the till listed option here). Then tap Next to get to the Checkout Summary. Be sure to verify that your cash amounts are correct. If you need to make adjustments, tap Checkout to return to the previous screen. After tapping Submit, the till will close and send data to the server. Virtual tills are tills that are tied to individual employees, rather than to a POS terminal or physical cash drawer. Any cash transactions made by that employee will be kept under the virtual till. For information, see Virtual Tills. 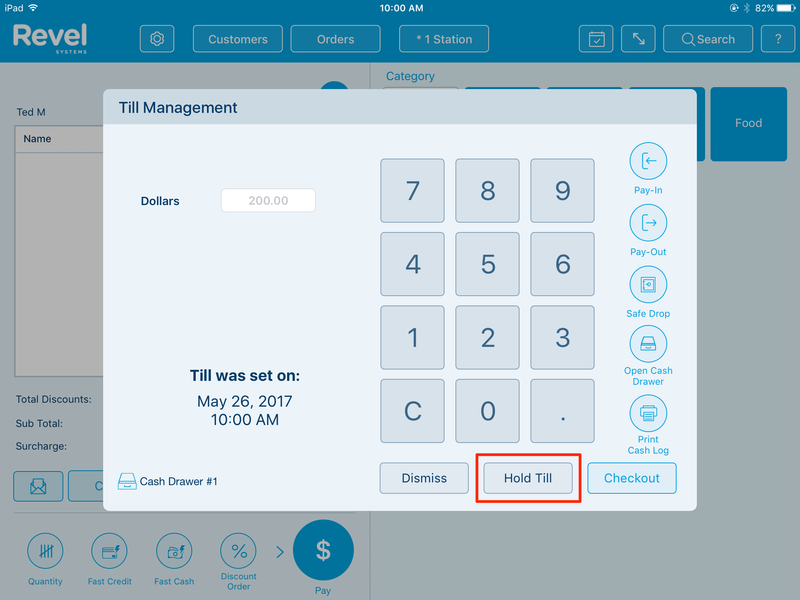 Enable Two Cash Drawers: Revel supports multiple cash drawers at a single POS terminal. If you enable multiple cash drawers, you will need to assign employees to each drawer. After that, the employee’s transactions will be logged under the assigned cash drawer/till. 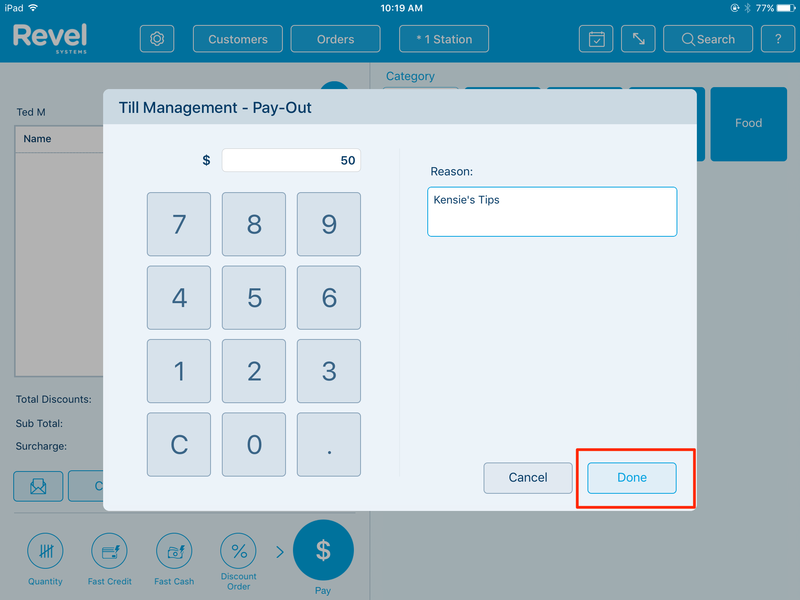 Allow Employees to Set Tills: Do you want your employees to be able to open the till? Then input the value for each currency. The starting and ending values will be recorded for each currency. However, the tills summary data (expected amount in till, variance) will be calculated against the default currency.